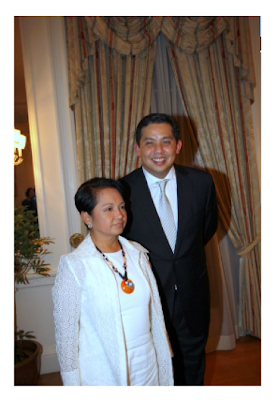 DOESN'T anyone find it strange that Leyte Rep. Ferdinand Martin Romualdez, who supposedly foot the $20,000 Le Cirque tab of the presidentita and her band of loyal sipsips, is nowhere to be found? He's just keeping quiet about the whole affair, which I think is even more incriminating for the presidentita dontcha think? 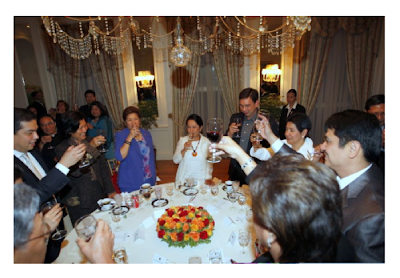 I wonder what Rep, Romualdez's constituents now feel about him after reading that he spent $20,000 for a lavish dinner for his beloved president? You see, apart from progressive Tacloban, most of the municipalities in the congressman's first district are either 3rd class, 4th class or 5th class municipalities - meaning people there are dirt poor and don't have access to basic services. Imagine how P1 million could've helped his constituents! Tsk, tsk. In case Malacañang still doesn't get it (and yes, Le Cerge, we know you're just doing your job but you're really just making an A** of yourself doing so), the howls of protest from the citizenry are not about the dinner per se and who paid for it, but how the presidentita (and her loyal sipsips) can sleep soundly at night, having just eaten a costly dinner (about P950,000), when the rest of her kababayan here can't even eat one square meal a day? And pls. don't tell us Le Cerge that nobody among your crew knew how expensive dinner at Le Cirque would be - well maybe YOU don't - but that's exactly why nagkandarapa kayo sumama sa dinner na yan is bec. you know can't afford kayo! No one is begrudging Mrs. Arroyo her good food and wine on her wedding anniversary at that, and by most accounts, Le Cirque is one of the best fine dining restaurants in New York, but yes, it is all about appearances. The leader of a third world country where most of its citizens earn less than $2 a day seen dining at an expensive restaurant just sends the wrong signals doesn't it? There she was trying to get some bit of good news for her and successful trip, hoping she gets a mention in the foreign media, but she just botches it by dining, unthinking, at Le Cirque. Even NY Post's Richard Johnson knew something was amiss in that picture. Then again, hey, at least she did get a mention in the US media. Oh aren't we all so proud of her! Now I don't mean to waste your time or bore you w/ text messages. But I just wanted to let you read the kind of propaganda coming from Malacañang, especially in the light of the recent $20,000-dinner at Le Cirque. These are just examples of the kind of poor, inefficient thinking that goes on in the seat of power. And I feel insulted, because man, if this is the kind of sh** we taxpayers are paying for (to defend the presidentita's honor), then I want my money back! And you don't want to know what Malacañang has been saying about Sen. Noynoy Aquino during the wake of his mother. Out of respect for Tita Cory, I'm not gonna publish it, but imagine how idiotic Malacañang's propaganda machine is, its handlers won't spare anyone, even the son of the deceased president. Tsk, tsk. Oh and maybe, someone should shut up Pampanga Rep. Mikey Arroyo, who is probably doing even worse explaining the dinner away. Loose lips sink ships. Stella, you hit it right on the spot again. Sometimes, I wonder why some people just don't get it. On another note, I can sense that you are a La Salle fan. Being an Atenean myself, I can only wish you good luck this coming Sunday. Thanks Isabella. Yes I'm fan of DLSU bec. I graduated from there. Anyhoo, good luck as well on Sunday. It will be another cliff hanger I'm sure.